Even though real house prices are rising in many countries, the global housing recovery remains on a two-speed pattern: in some countries, house prices have rebounded, while in others, they are still recovering. The bullet points below give a summary on experts’ views on current house price developments, policy response, short and long term outlook, and potential risks. The risk of a raise in interest rates. On the risks to emerging markets, “In some parts of the emerging world, housing markets have grown well ahead of income in recent years. US interest rates are about to rise, and international capital will revert to the center, seeking higher and safer yields. This will bring about an earthquake in housing markets at the periphery of the global financial system,” according to Alessandro Rebucci (Johns Hopkins University). Also, an article from Bloomberg notes that “Experience shows that when the Fed has embarked on significant rate hiking campaigns, there are global repercussions.” Separately, a new analysis from Moody’s says that the eventual rise in interest rates, and an economic slowdown with an increase in unemployment could prompt corrections in housing markets. In this context, Moody’s studied declines in real house prices since 1973 and how it affects GDP. In 50 episodes of real house price declines, Moody’s finds that house price corrections coincide with a GDP shortfall of around 6 percent and this shortfall is larger in advanced economies compared to emerging economies. This is in line with the view that wealth effects are bigger in advanced economies and lower in emerging economies. Housing affordability crisis. “New risks as young Londoners priced out of housing market (…) The problem has become a hot issue in national elections due next month.” writes Reuters. The issue of housing affordability is also being talked about in other parts of the world. For example, housing affordability was one of the most talked-about subjects at this year’s American Planning Association’s annual National Planning Conference (Citylab). Moreover, in an excellent article, Kate Allen of the Financial Times says that we need to ensure that the lowest paid workers are not forced out of the cities. “Spiralling living costs and poor housing conditions are pushing much-needed workers out of these cities — and inequality is rising (…) A dazzling array of policy options [demand controls, supply controls, remove the market, remove spatial restrictions, encourage renting, build elsewhere, and subsidize ownership] has emerged in recent years as employers and city authorities worldwide attempt to stem the tide — none is a complete answer in itself; all have pros and cons,” according to Allen. The risk of persistently low oil prices. So far, the decline in oil prices has had no major impact on the housing market. However, it “(…) will impact housing values over the next 15-24 months, but the effect varies geographically” according to Chris Stroud (HouseCanary). Stroud notes that while some markets positively correlate and have a dampening effect on home prices (e.g. Houston), others negatively correlate and can be stimulated by falling oil prices (e.g. Detroit). This view is also shared by Jed Kolko, who says that in oil producing markets, home prices tend to follow oil prices, but it typically takes two years for oil prices to fully affect home prices in those markets. “For instance, in the 1980s, the largest year-over-year oil price declines were in early- and mid-1986. In Houston, job losses were steepest in late 1986. But home prices didn’t slide most until the third quarter of 1987. Since 1980, employment in oil-producing markets has followed oil-price movements roughly two quarters later and home prices have followed oil-price movements roughly two years later,” according to Kolko. Moreover, an analysis from Goldman Sachs also looked into previous episodes of oil price decline and its impact on the housing market. The analysis points out that “(…) construction [in Texas] grew dramatically during the boom phase of the oil cycle, with starts tripling between 1975 and 1984. By comparison, housing construction has been more moderate over the past several years.” Therefore, the negative impact in oil producing housing markets is expected to be smaller compared to previous episode. However, other analysts are already worried. In a recent note, Capital Economics says that “The slump in oil prices has already had a huge adverse impact on drilling activity. (…) And it surely won’t be long before local employment and income levels are hit. That would obviously pose problems for the local housing market.” Meanwhile, Forbes says that the energy sector could spark a repeat of the subprime bust. House prices have started to decline in Calgary (Globe and Mail), and Dubai (National). Also, “Lenders are reassessing risks in energy towns as roughly $1.1 trillion of property loans come due across the U.S. over the next three years,” according to Bloomberg. There are also eight academic papers plus comments from discussants. The editors offer an executive summary of these papers. While the total number of real estate transactions has decreased from the 2013 peak, the total value of real estate transactions has dramatically increased, reflecting higher average prices and compositional changes. Land prices appear to have increased at the fastest pace, followed by villas where land is typically the most important cost component. 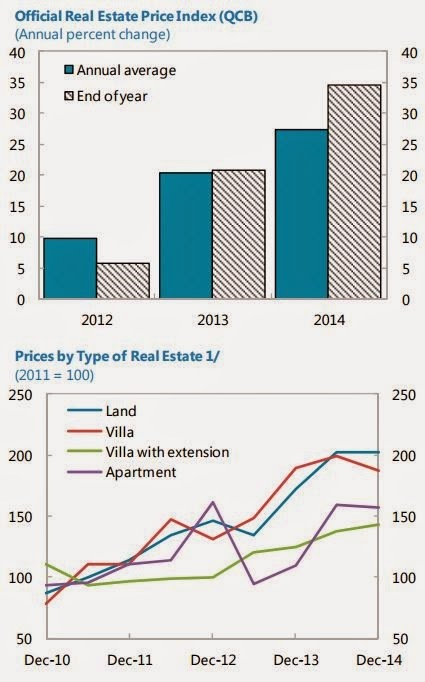 Price increases have been slower for apartments and villas with extension (e.g., a guest house).